Yes, those are the two lamps from '26. I hadn't realized that the "ladder" piece high on the wall is also a light fixture. RMS is my guy . . . the original RomantiConstructivist ! Yes! Isn't that a wonderful photo? I'm such a Luddite with technology. Andrew posts beautiful photographs, including some of Glenbrow. Hopefully he will be back (he's written several pieces about Sherrod Brown) to see Glenbrow in it's glory with foliage. What is the wooden creation to the left side of the photo with the stack lamps in the Beach house....that is a mouthful...but this appears to be a stack of shelves though they would have little practical purpose at that height. Was is purely a piece of wooden decoration? 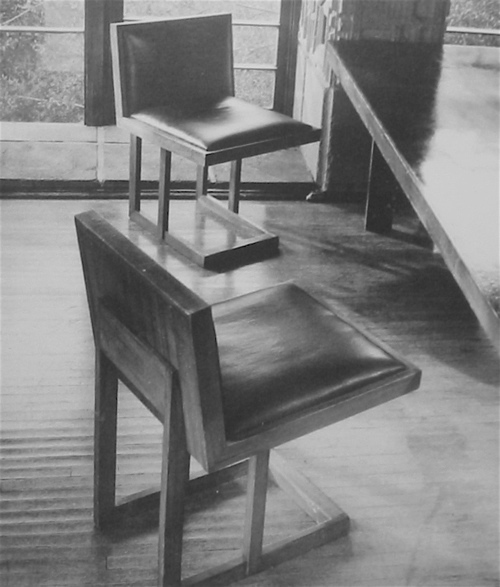 Other than the 'pews' and the octagonal table (dining, cut down to coffee), all the furniture, free-standing and built in, was designed by RMS. It is odd if only the overstuffed chair and the lamps were taken, since the other pieces were also given to USC. That long table would fetch a lot of money. In her latter days, Harriett was looking frantically for someone to take her house. At one point, she seemed to settle for giving it to Gus Brown, who said he would restore it and open it to the public. Harriett's nephew, a lawyer, helped get her extricated from that deal, which would have been a disaster equal to the bequest to USC. That poor masterpiece deserves better. It would not be a bad thing to remove the entire building and start from scratch. It was not only the earthquake that caused damage. The original quality of the block construction was not good, with too much organic schmutz in the mix. At the end of construction, the only person working on the job was a high school senior. The money ran out, and all the professionals left. Matt, if you're looking at the colored photo, that is a built-in light fixture. It appears in the black-and-white photo, where it is unlit . . . I was referring to this image and the rising stack of mini shelves on the left hand side. Right. In the more recent color photo that Mod mom mentioned and I linked to, that fixture turns out to be a light source -- or at least a lighted something to look at . . . Thanks, sorry for not looking closer. Did this sort of geometric lamp pre-date Wright's tall lamps? And I never thought of Lovell Beach House as a post and beam structure, but you could make that argument. The Schindler Wolfe house is 1928, the tall Taliesin lamp dates from 1933. There was clearly a dialogue between these two giants. facilitating of an electric light source) -- informed by the designer's preference, in each case, for strict orthogonality and for a robust and expressive constructivism. bear comparison to contemporary Arts and Crafts examples, the same cannot be said of these lanterns, which are new-age artifacts, albeit in a romantic vein ? I really enjoyed your links Peter, thanks. Currently on another thread someone complained of going off topic but I have found such interesting information when you chatters veer off the beaten path! Please continue. Hard to believe that the Wolfe House was demolished and in 2001. the links on the Esoteric Survey are no longer so I'll have to do a little research being a Schindler novice...such a magnificent house. On a bright note, scrolling through the auction pieces I discovered that a chair (in rough condition) that we found in the tower, that Joe uses for his car's plug in resting spot is actually a Bertoia, providing us with another restoration project. 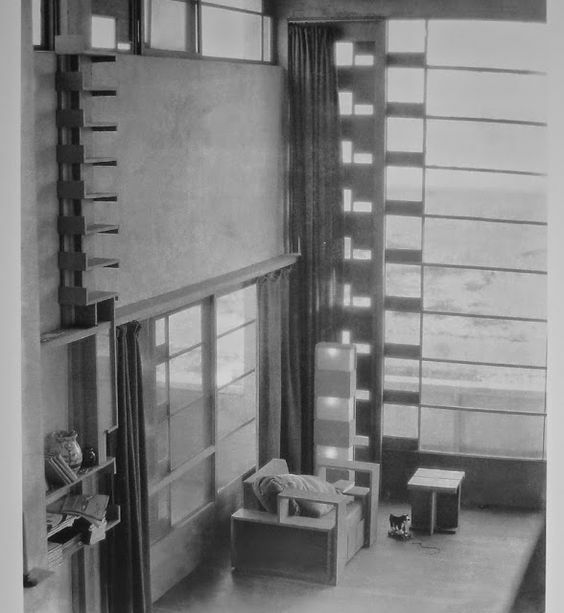 Judith Scheine, architect and Schindler scholar, has claimed that Wolfe was a precursor to Fallingwater. I've also heard that the floor lamp was the only artifact salvageable from the rubble after the house was torn down.